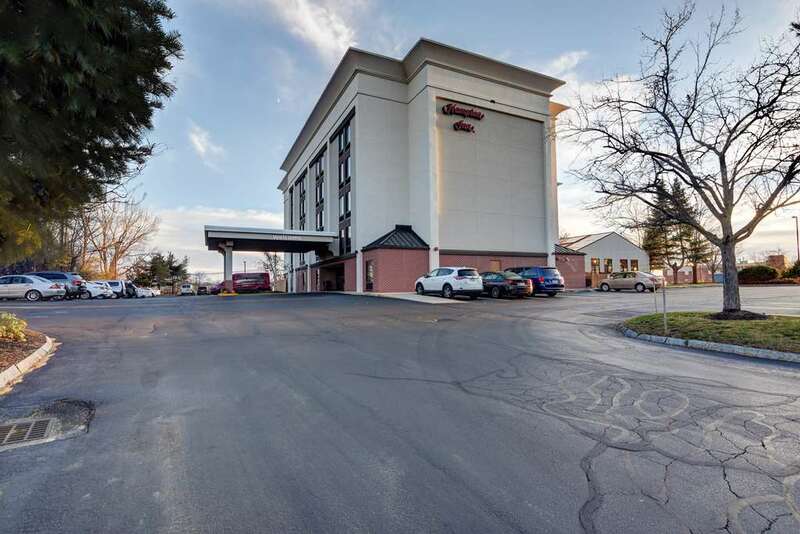 The Hampton Inn Portsmouth Central hotel is only minutes from historic downtown Portsmouth New Hampshire and is convenient to I-95 and Route 16/4. The hotel is situated right outside the Pease International Tradesport and ten miles from the University of New Hampshire. The Hampton Inn Portsmouth is perfectly located in the heart of the seacoast and for those on vacation Water Country is an easy ten minute drive and the major malls and Kittery Outlets are less than five minutes away. Our Portsmouth hotel provides complimentary van transportation to and from Water Country and the Tanger Centers at the Kittery Outlets. Guests will have over 100 restaurants to choose from that range from casual fare to fine dining with most located less than three miles from the hotel. Our Hampton Inn Portsmouth Central is a five storey hotel with 126 interior corridor guest rooms that are equipped with coffeemaker iron and full-size ironing board hair dryer two phones with dual lines and data ports complimentary local calls high-speed internet access and color cable TV with complimentary HBO pay movies and Nintendo. We also offer connecting rooms cribs express check-out and laundry/valet services. Sure to please the busy executive or leisure New Hampshire traveler Hampton Inn Portsmouth Central hotel guests will enjoy complimentary On the House hot breakfast buffet served daily cocktails from 500pm to 700pm and a USA Today week days. Guests will also have access to our indoor pool and whirlpool fitness center and wireless internet connection throughout the hotel. We love having you here in New Hampshire at the Portsmouth Hampton Inn hotel. Library Restaurant: A classic traditional steakhouse The Library Restaurant exudes an atmosphere of timeless elegance. Guests experience the finest cuts of prime and choice steaks and chops the freshest seafood with outstanding service in one of the most beautifully preserved historic buildings in New England. Dolphin Striker: The Dolphin Striker has been one of the hallmarks of elegant dining on the Seacoast for over 20 years. The food is sourced locally creatively prepared and beautifully presented. Newicks: Newick*s brings over 60 years of quality seafood experience to the state capitol. With a warm dockside atmosphere and a friendly staff you will think that you are on the banks of the Piscataqua River. Oar House: The Oar House serves seafood poultry beef and other specialties in an historic maritime setting in downtown Portsmouth. Jumpin* Jay*s Fish Cafe: Located just two blocks down from Market Square Jay*s has become an overnight institution among locals who appreciate exceptional seafood. The quality of fare is unsurpassed. The atmosphere is casually hip with no pretense. Reservations encouraged.